Eight-year-old Judah Bausili has been playing a whole lot of Pokémon Go lately. He and his dad, Ben, have caught 46 so far. “I’ve caught Doduo, Bulbasaur, and the last one...I can’t remember,” says Judah. Judah has always enjoyed catching Pokémon, but he hasn’t always been discerning about the types he caught. 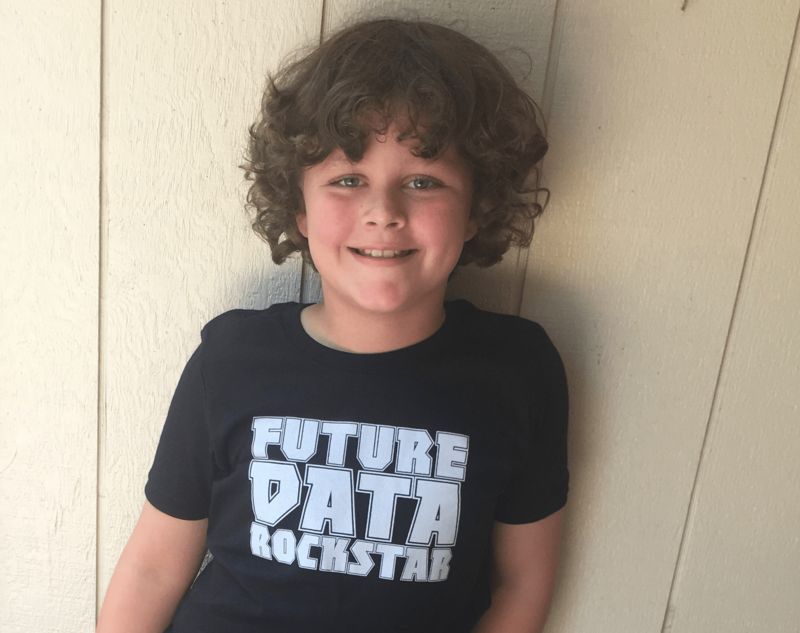 And that’s where Ben, his data-minded dad who happens to work for Tableau Gold Partner InterWorks, saw an opportunity. Ben pulled some Pokémon character stats from Wikipedia. Then he gave Judah a quick tour of Tableau. “I explained dimensions and measure. Then I showed him how to build charts, then had him try it,” says Ben. Five minutes later, Ben turned on the camera. This exercise was Judah’s first introduction to Tableau, but it was hardly his first lesson in seeing and understanding data. It all began when Judah was just 6. Ben was sitting on his bed, analyzing data, when Judah came into the room. Since then, Judah’s often watched his dad work, sometimes asking questions about what he sees on the screen. And Ben has seized those moments to impart small lessons. Because Judah has been around computers since a young age, teaching him how to use Tableau took no time at all, says Ben. “As I find opportunities in daily life, I try to introduce him to technology. And that made teaching Tableau easy, because Tableau is very intuitive,” says Ben. As for Judah, he’s learned that watching is one thing; doing is another. 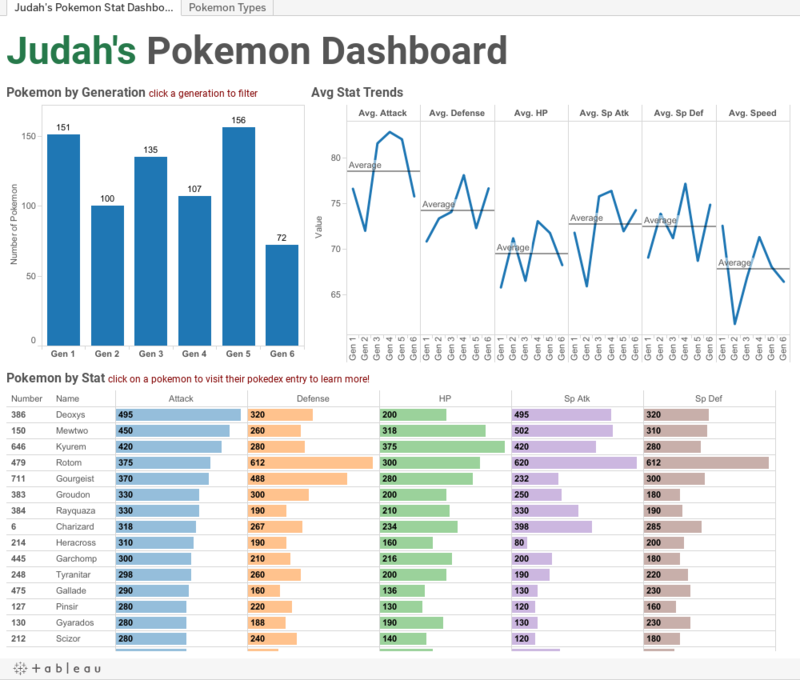 Ever since he tried Tableau, Judah has been bitten by the bug. “I really, really liked it because it was really fun to do,” he says. For his next act, Judah wants to explore Marvel Comics data—and he’s considering letting his younger brother, Leo, help. “He wants to make his own dashboard now,” says Judah of his brother. It appears watching Dad work, while once nice, is no longer enough. “The other day, I was building a dashboard for a client. And Judah asked me if he could do it for me,” says Ben. How can I make the dashboard to display "on top" like in this article? Does it require a special coding in Tableau or in the web page? If you mean how Judah sorted by the strongest attack, you go to the category you want to 'sort' by and then when your mouse is hovering above the criteria you will see a pyramid-bar looking object. Click this to resort and it will sort by descending (1 Click), then ascending (2 Clicks), then revert back to normal (3 Clicks). I'm going from memory so this may be a little off, but experiment. If you meant how he go the sheet to the top of the dash that's simple: Click (hold), drag and drop. It answers, step by step, your "on top" question. I really enjoyed your video and I'd like to create this same dashboard with my son. I could not find the wikipedia data you referred to. Would you please help me find that list of Pokemon stats? Here are some stats you can use. I don't know if it's what Judah and Ben used. Judah and Ben scraped and combined data from Wikipedia (https://en.wikipedia.org/wiki/List_of_Pokémon) and Bulbapedia (http://bulbapedia.bulbagarden.net/wiki/List_of_Pokémon_by_base_stats_(Generation_VI-present)). Good luck and have fun with your son! Love this story, thanks for sharing. I was interested in data as I child and enjoyed looking through phone books and directories. This kid quickly learned Tableau and was able to gain insights from data tables.